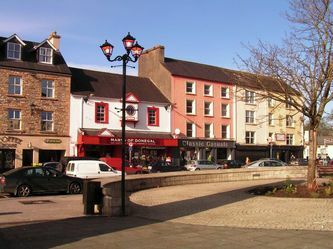 Donegal Town is a busy shopping and tourist town in south Donegal where the River Eske flows into Donegal Bay. It was invaded by the Vikings in the 8th century and they used it as a port. 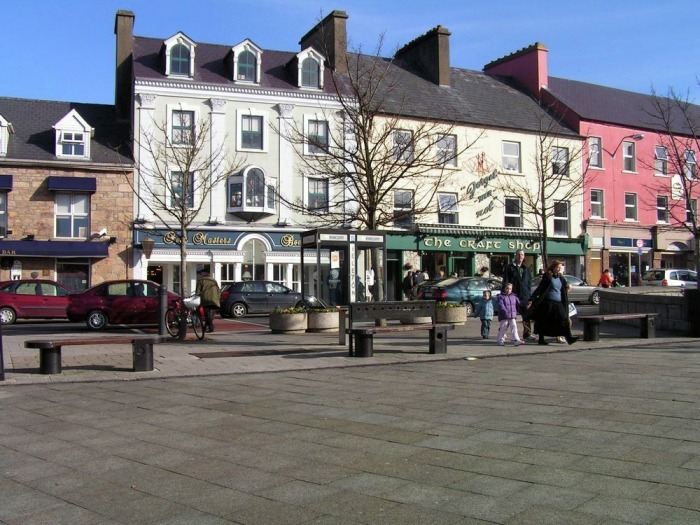 This invasion is where the town got its Gaelic name, Dun na nGall, which means ’Fort of the Foreigners’. The Vikings built a garrison in the town, thought to have been in the grounds where O'Donnells Castle/Donegal Castle now stands. In recent years human remains were found in the grounds of Castle these are thought to be Viking. 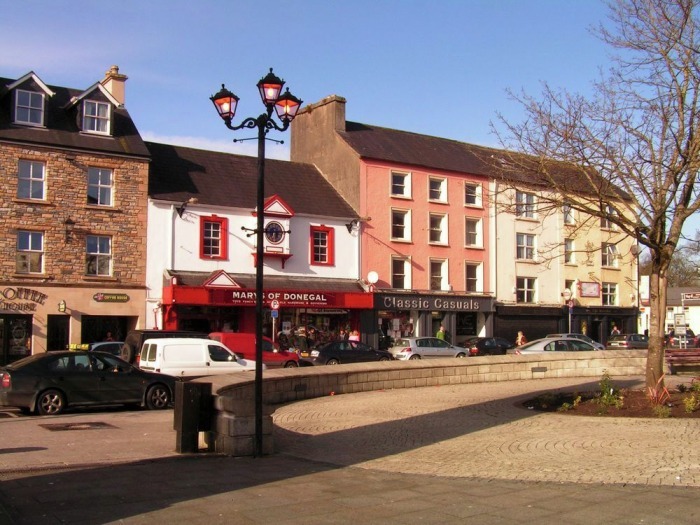 Donegal Town continued as a port until the 1960s when the last commercial boat left the harbour, sailing to Scotland with its load of electricity poles. 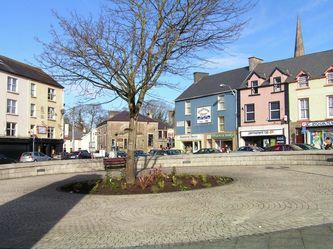 The centre of the town is called 'The Diamond' and markets were held here until 1967. 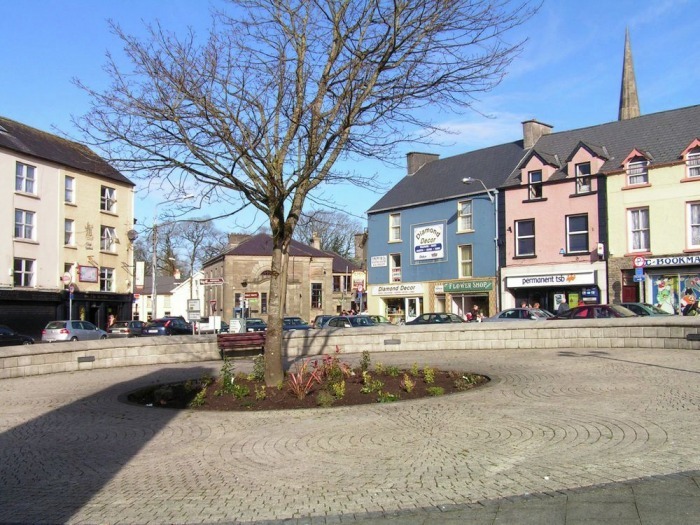 The markets were held on the second Friday of the month when the town would fill with farmers buying and selling cattle, together with various other traders selling their wares. The market day would have been a great social occasion with locals being able to catch up on each others news. In the Diamond stands an Obelisk in memory of 'The Four Masters' (see below). 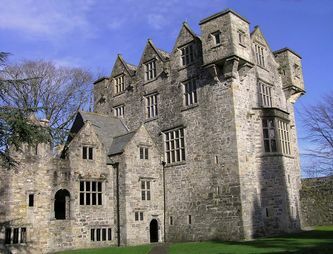 The castle was built by Red Hugh O’Donnell in 1474 . 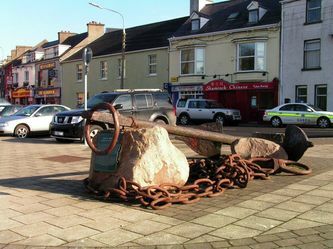 Red Hugh was ”Principal of the great royal family, who ruled the Kingdom of Tir Conaill (Donegal) from 1200 until 1601. It was built on a bend on the Eske for defensive reasons, the river protecting it on two sides.” There is now a statue of Red Hugh by the artist Maurice Harron down on the pier. 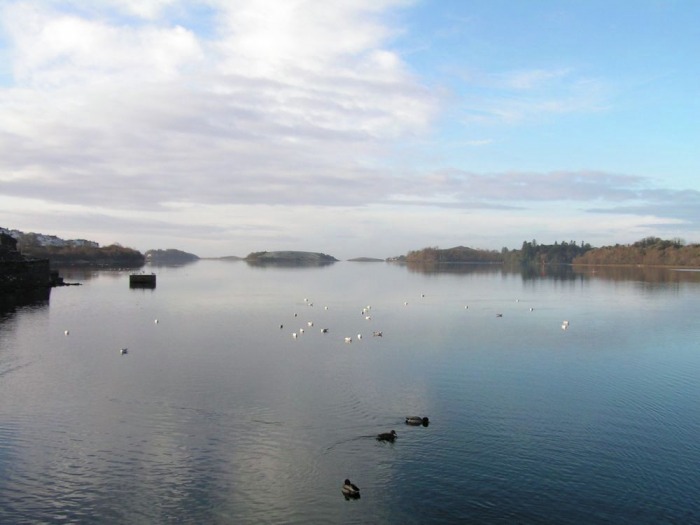 On Lough Eske, just outside the town, there is a tiny island and on this island is the remains of O'Donnells Keep where the O'Donnell Clan held their prisoners. All that is left of the Keep is one wall and that is now hidden behind trees and shrubs. A picture of the little island can be seen in the photos below. On the Ballybofey road out of Donegal Town, just near the edge of the town and down to the left there is a Famine Graveyard where vicitims of the last famine (1845-49) are buried. There is a signpost on the road pointing to the graveyard. The Diamond is the central pedestrianised plaza in the town. It was designed by Captain Basil Brook who also built the Jacobean style extension at O’Donnells Castle (Donegal Castle) when he was given the Castle by the English Crown during the Plantation of Ulster and for his part in the Nine Years War. 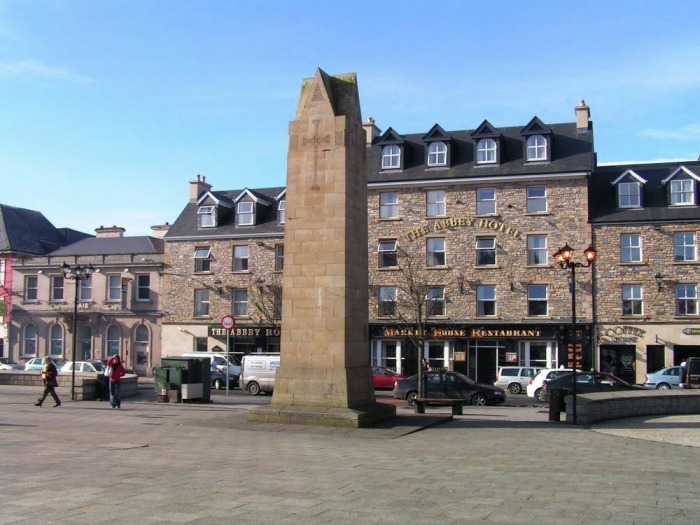 He was also given Lough Eske Castle which is now an hotel, Solis Lough Eske The Obelisk which is to be found in The Diamond (central plaza in the town) commemorates four monks called the Four Masters who compiled and wrote the Annals of the Four Masters between 1632 and 1636. The Annals of the Four Masters covers Irish history from 2242 BC to 1616 AD and remains one of the most important historical writings in Ireland. 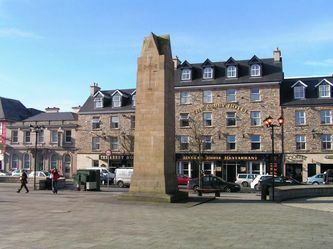 The chief author was Micheal O’Cleirigh who was assisted by Peregrine O’Clery, Fergus O’Mulconry and Peregrine O’Duignan whose names are carved into the lower part of the Obelisk. 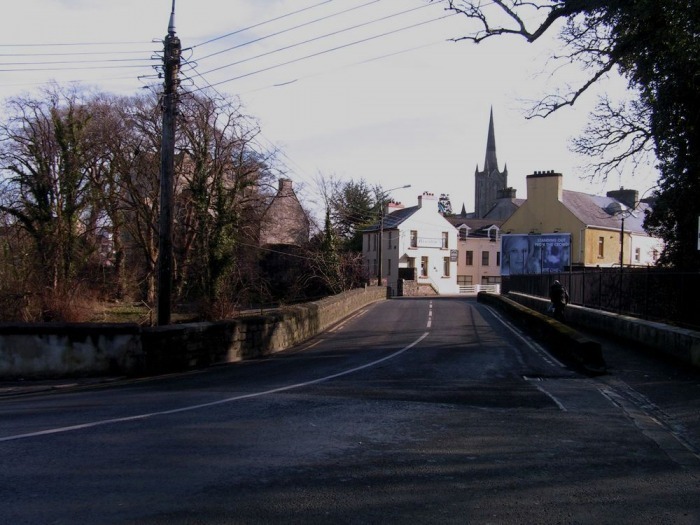 Micheal O’Cleirigh would travel around Ireland during the summer months gathering information both historical and mythological, and return to the Friary in Donegal Town at the end of summer where the winter months would be spent correlating and writing up the information gathered. Manuscripts of the works can be seen in Trinity College, Dublin and Univeristy College Dublin as well as the Royal Irish Accademy. A copy of part of the Annals can be viewed in the museum at the Franciscan Friary, Rossnowlagh. "This anchor probably belonged to the frigate Romaine, which was one of a French squadron out of Brest on the 16th September 1798, in support of General Humbert's army in Mayo. Wolfe Tone sailed with the squadron. Following engagements with English naval forces off the Donegal coast, the Romaine, with two sister ships, anchored in Donegal Bay on the 13th of October 1798. Learning of Humbert's surrender and observing English militia on shore, the Romaine cut her cable, leaving her anchor and sailed back to France." 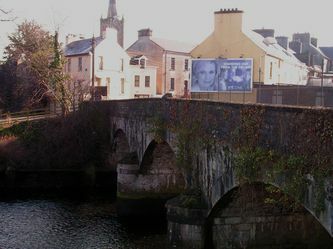 Walk to Boyce’s Bridge (on the Killybegs road) just out of the centre (The Diamond) in Donegal Town and to your left you will find the Bank Walk. 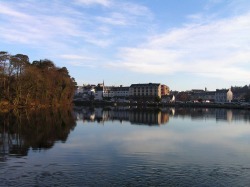 It is a path of about 2.5 km along the west bank of the River Eske leading to Donegal Bay. Take some bread to feed the ducks and swans!